Hillister Post Office now on display in Woodville’s Heritage Village Museum on Hwy. 90. There seems to be several probable sources for the name. A Mr. Hollister had been a railroad official and there was a sawmill operator by the name of Hallister. The current name may be a misspelling or a compromise, but whatever the reason, the post office opened under the name of Hillister in 1882. Hillister’s economy was lumber and when one mill closed, another soon took its place. Hillister’s population remained around the 100-person mark into the 1940s. Before the decade was out, it had increased to 250 – its all-time peak. By the 1980s it had declined to a mere 59 people. 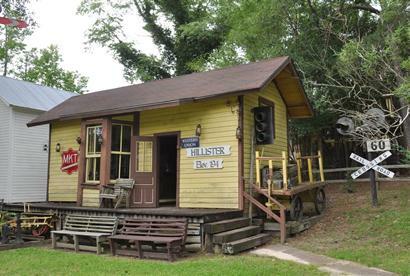 Hillister has maintained a presence in East Texas history for having one of its pioneer structures exhibited in Woodville’s Heritage Village Museum.